Stressful… right? Yet this is what a honey bee colony does every single day. On top of that, every single thing they produce is beneficial in some way! Ever seen the inside of a honey bee hive? It’s incredible. Everything is completely ordered, clean, and functioning at all times. At times I have had trouble taking care of one baby at a time, and honey bees take care of hundreds, all while building a house. As a former beekeeper and now watching my son take care of his bee hive, I’m in constant awe of how amazing bees are. The word apitherapy refers to the practice of using bee products like honey, bee pollen, royal jelly, and beeswax in beneficial ways. Even honey bee venom has been used therapeutically! Sound crazy? Check out this video from the Discovery Channel that explains it. While we usually prize bees for their honey, royal jelly, and other beneficial (and tasty) by-products, beeswax deserves to be high on the bee appreciation list as well. Bees actually make beeswax in order to form the structure of their hive. They secrete wax from special glands, then chew it up and use it to form perfect hexagon-shaped honey comb. Ever tried to even draw a perfect hexagon? It’s tough even with a ruler, and bees do it with mathematical precision. Honeybees have also apparently been on board with minimalism since the beginning. Their hexagon-shaped honeycombs offer the most storage space with the least amount of building material (in this case, beeswax). When beekeepers harvest honey, they remove the cap off of each cell in order to extract the honey. These cappings are melted down and filtered to remove non-wax particles which yields the beeswax we use in many beauty products and DIY recipes. Beeswax is one of the 7 ingredients I buy in bulk and always keep on hand for a good many of my natural recipes and remedies. It has dozens of uses around the home. Beeswax is an excellent addition to cosmetic products, for many reasons. Unlike petroleum jelly, which is used in a large variety of beauty products, beeswax will not “suffocate” the skin, but rather allow it to breathe while still providing a protective barrier. Beeswax helps to thicken homemade cosmetics and lotions because it is solid at room temperature and has a relatively high melting point of 147 degrees Fahrenheit. 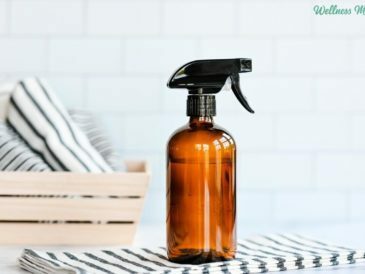 This is especially helpful in recipes that include high amounts of coconut oil, which has a low melting point, or other oils that are liquid at room temperature. 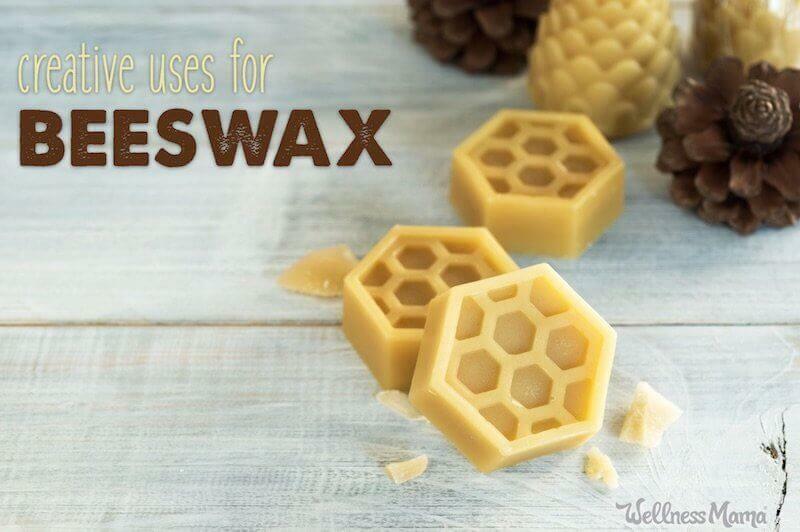 Beeswax is an incredibly versatile natural ingredient for DIY beauty and natural home products. 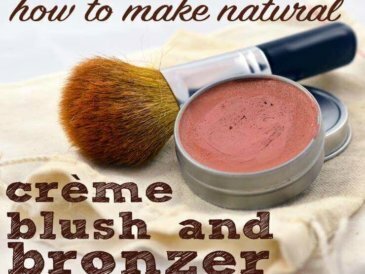 It is a staple in my homemade beauty products and around our house. I’ve been making my own deodorant for years because it works so much better than store bought. One of the ingredients I use is beeswax because it helps form a natural protective moisture barrier. This means it helps avoid sweat stains on clothes without the need for harmful and unnecessary chemicals. Here’s my favorite DIY deodorant recipe, as well as a super-powered version for men. I’m biased, but these are the best moisturizers in the world. A perfect combination of oils, shea butter, and beeswax forms a solid soap-like bar that is used on dry skin. It helps soothe skin, locks in moisture, and even has natural anti-wrinkle properties. Make your own with this simple tutorial. 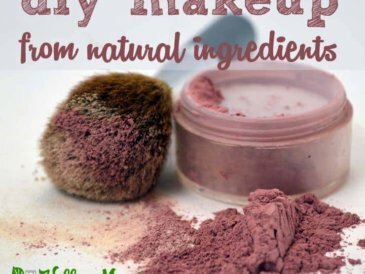 You can make dozens of homemade beauty products with the same set of simple ingredients. 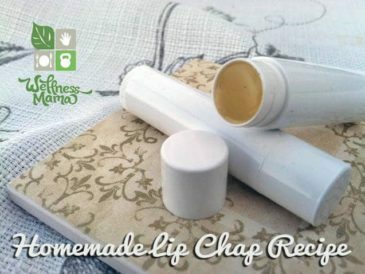 This lip balm recipe uses the same ingredients as the lotion bars but with a couple of added ingredients for scent or color. 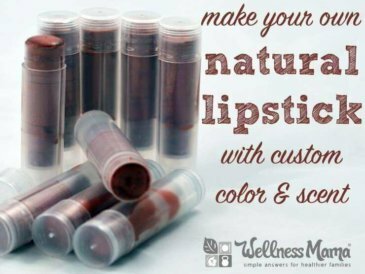 Once you have these basic ingredients on hand, you can make lip balm for pennies a tube (instead of the $2-3 in stores!). My favorite is this imitation Burt’s Bees lip balm. Like the lotion bars above, this recipe uses beeswax, oils, and shea or cocoa butter. This recipe is a modified version that allows it to be used in a deodorant container. This makes it a little easier to store and apply than the traditional lotion bar. Recipe here. I ditched the scented candles and air fresheners years ago. We only use beeswax candles in our home and they are easy and fun to make yourself. They also make great homemade gifts for the important people in your life. Try this tutorial to make your own! Beeswax is often added to soap recipes to make the finished soap harder and last longer. It should only account for up to 2% of your soap recipe. Add any more than that and your soap will begin to lose lather. Try this spiced essential oil soap. My husband loves it! Most babies will have a diaper rash at some point. I make an effort to only use natural skin care products, but with the new sensitive skin of a baby, I take extra care to make sure all ingredients are natural and safe. I use beeswax in diaper rash cream as a thickener and because it provides a protective barrier for the skin while helping the other beneficial ingredients stay on the skin so they can have a greater effect on clearing up the rash. A simple salve of beeswax, coconut oil, and magnesium makes a great remedy for cracked heels. Here’s how to make it. I really believe that almost everything we need to remedy minor ailments can be found in nature. Beeswax is a great remedy for cracked hands from gardening or outdoor work. It also creates a protective barrier to help avoid future damage. I like to add in beneficial herbs from the garden to speed relief even more. Plantain grows in most yards and is a natural remedy for bites and stings and even sunburn. Grab the recipe for DIY gardeners’ hand salve here. I keep this “boo-boo lotion” on hand to treat scrapes, stings, poison ivy, bruises, and for any other sort of mild injury my kids manage to get. It works almost as well as kisses for relief of minor scrapes and boo-boos. When any illness strikes, I turn to beeswax based natural remedies. 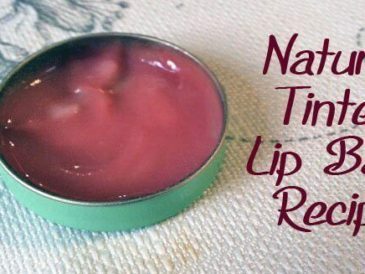 Homemade natural vapor rub helps when coughing and congestion hit and provides some relief without slathering petroleum jelly all over your skin. Heather from Mommypotamus has a great tutorial on how to make your own reusable food wraps. These have a “cling” that makes them a wonderful alternative to plastic wrap. Not everyone has the time and interest to make their own food wraps, so it’s worth mentioning that there are wonderful beeswax food wrap options online as well. Although I like things natural, I won’t ask you to go digging in a bee hive! I like to buy beeswax pastilles because they are incredibly easy to work with when you need smaller amounts for lip chap and salves. Having pastilles isn’t necessary when you are doing larger projects like candles because you can measure by weight, rather than by the tablespoon. You can also buy beeswax in block form, which is slightly less expensive than the pastilles. Another option is to buy it locally if you are able to get in touch with beekeepers in your area. This helps support local beekeepers (which is important!) and you can often find it relatively inexpensively. 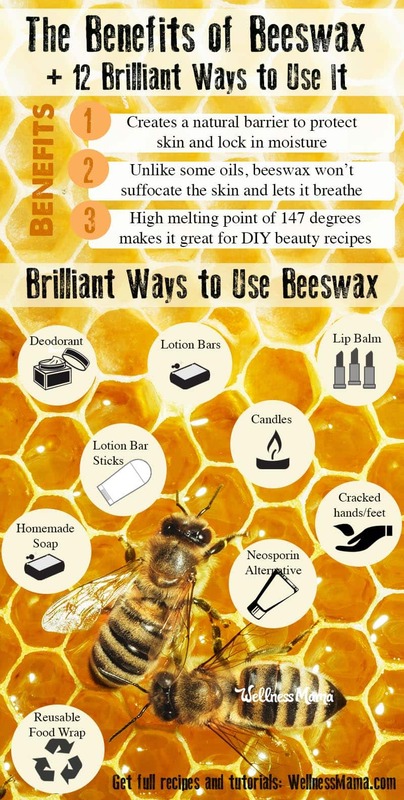 How do you use beeswax? Share some of your favorite uses below!